Best parking is in city lot at corner of 2nd Street and Spokane Avenue, diagonally across the intersection from the Firebrand Lounge. Access this lot from 1st Street. The Firebrand Lounge offers traditional breakfast & lunch items, as well as a coffee kiosk with specialty drinks, smoothies, and house-made pastries. The evening menu offers contemporary small plates inspired by regional food sources and flavors from around the world. Enjoy a glass of wine and tapas to get your evening started right or try a few small plates to make it a meal. Food was ok, nothing special. Service needs some work. It is a seat yourself restaurant, which is fine, but we walked by 2 servers, front desk clerk, a barista, and bartender, not a single one gave us any kind of acknowledgement. They need to remember they are in the hospitality business. This is THE venue not to miss in Whitefish! And if you are lucky enough to be there with local live music, you are in for a treat. The chef is creative, the well drinks feature strong brands, the beer selection is on point, the staff is friendly. We love the Firebrand and look forward to being back soon. I expected more. It seemed like they were just waking up. Pretty dining room and food was good, but not amazing. Nice ambiance, loved the fireplace! Breakfast was nice, enjoyed the local Huckleberry French toast! What began as a shared birthdate with a friend and a gift certificate we won, has now turned into our annual celebratory tradition. It is fun to try different and tasty cuisine we love that our spouses would not care for! It's our yearly night of girls fun! Staff has always been wonderful and we don't mind the free birthday dessert! Had lunch with a friend at the Firebrand the other day. VERY small limited lunch menu. My chicken sandwich was just OK. Seated by the prime windows that overlook a most unattractive parking lot. Will not go back for lunch again. I was somewhat disappointed in the service. It took a very long time to get our food and drink orders. My husband had to go to the bar to get my wine which was sitting in the service area for a long time. There was inky one server on which was definitely the issue. The restaurant/ lounge was very busy (it was a Saturday right before New Year's which is the busiest time of the season in Whitefish) so they could have had more servers on to help. We enjoyed the amazing drinks and great food. The only thing I didn’t care for was the dessert. It was ok, but not as good as I was expecting. We come to the Firebrand often for dinner before shows and concerts. It is an elegant, quiet place and great for people watching - both in the hotel lobby and on the street. We went there for our anniversary dinner and was surprised to find there are only 2 dinner items on the entire menu. The rest was "sharable" bar food. We left and went someplace else for a nice dinner. Don't go with expectations, there is no hostess to seat you, and you will be eating dinner in a open hotel lobby, not a restaurant. This was very much a lounge and not really suitable for a sit down meal. Good for drinks and a bite with a larger group. Great place to gather, whether inside by the fireplace or up on the rooftop! Food selection was great and everything we had was very tasty. Service was great as well! Highly recommend for a casual, relaxing evening. Intrigued by the tapas menu, we dined at The Firebrand Lounge on a balmy Friday evening. We basked in the beautiful weather, enjoyed music attuned to our ears—not so loud you can’t converse. Our server,Johnna, was enthusiastic, exemplary, and accommodating to all my (many) food allergies. Duck sliders, and Wagyu sliders. Each plate was creative in tastes and presentation. We highly recommend this fun dining spot and suggest you request Johnna as your server. We had an amazing time on the patio, the food was excellent and service excellent. I wish I could recall our servers name, she was amazing and recommended us a very good bottle of wine. Outstanding ambiance. Would definitely recommend. Don’t waste your time....sat here for 10 minutes waiting for someone to help us. We made eye contact w 3 workers-it became a game to see when we might (never) get service. Tapas style menu. No liquor license, so only beer and wine available. Overall, good food, but small portions being tapas style and lack of ability to order mixed drinks, bourbon or other cocktails sent us elsewhere after dinner. Great atmosphere! The food and service were fantastic. Portions were small. It would be great to have a few more "Meal" options. It was not busy when we arrived but with self service seating, I am not sure how it would have worked when we had a reservation if all of the tables were full? The service staff went out of their way to accommodate our needs. The food was very good. My husband and I took his mother to Firebrand for dinner for mother’s day, and she is pretty picky about her food! She loved every single bite and wants to go back as soon as possible! Everything about our dining experience was perfect — the waitress, the food, everything was enjoyable! My husband and I came for my birthday dinner and everything about the restaurant was amazing! The service, the food, everything was divine and perfect! I’m headed there for another special dinner right now! This is our favourite place in town. For a night away at the hotel or just a wonderful meal or glass of wine, ambience is cozy and comfortable while remaining posh, food and wine are exquisite, we love it!! My sister and I have been there twice for dinner, and were completely satisfied both times. 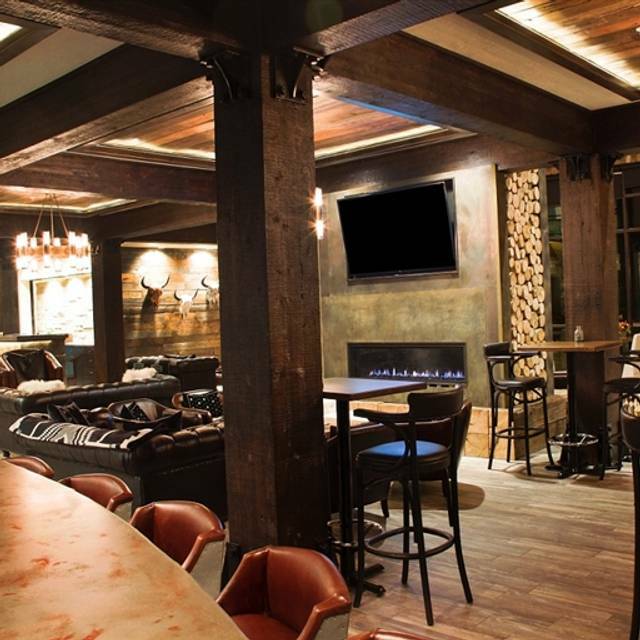 Love the old Barnwood Decore and the general arrangement of the bar and dining area. Great food, good wine, and reasonable prices. Great place to stop for a bite to eat before or after theatre in Whitefish. We enjoy the fire place and the charcuterie board to start our meal. My sister and I like to try all the different restaurant in the valley. We finally made it to the Firebrand and were not disappointed. On a side note, my daughter and her husband did the barnwood interior. They are the owners of MKM Reclaimed and she highly recommended we try it. Great place to unwind after a day on the mountain. Friendly staff and great small plates. We spent our last night on a trip to Glacier at the Firebrand and ate in the Lounge. The "meals" are more tapas style, and the two of us shared five different orders. That was way too much food for retired seniors and the problem was, everything was so delicious that we ate it all. I was especially impressed by the gnocchi (Yes, the gnocchi! It was incredible!) The chef's special dish that evening was scallops on Forbidden Rice, and that also was fantastic. This chef is very creative and knows exactly which combinations will go best together. The service was also very good, which we expected--two nights in this hotel and everyone from the front desk to housekeeping was super friendly and considerate. Our entire trip was amazing, but we both agreed that when we return, we will stay the entire time at the Firebrand and eat there whenever possible. Fun small-plate restaurant that is adjacent to a busy bar. Food was good, but not a white table cloth atmosphere. Chef driven. All good. Great food, decent wine list and the wait staff was outstanding, can't wait to go back and try it again! This was a great option since we were staying at the Firebrand Hotel. The food was interesting and wine was very good. Atmosphere is fabulous and nice music and people watching! Loved our meal here. Nice menu. Gnocchi and steak both excellent. Excellent small dishes and very helpful wait staff. They do have outdoor dining but it was still in the high 90's at 6:30 PM so we stayed indoors. Trendy dining and people watching spot. Fireplace with couch seating, high bistro tables, traditional dinner tables and an outdoor patio. Lots of choices for drinks and snacks as well as meals. Waitress told us portions were small, but we had plenty to eat with one entree each. Lovely evening with wine flight, excellent food and live musician!